I made these bit and accessory holders to consolidate all my Dremel® stuff in two locations (one for the house, and one for the garage) rather than having them scattered amongst multiple cases. The collective bit storage holes for those cases was insufficient, so most of my bits were just tossed in the case. Consequently, I'd have to rummage through them to find the bit I wanted. 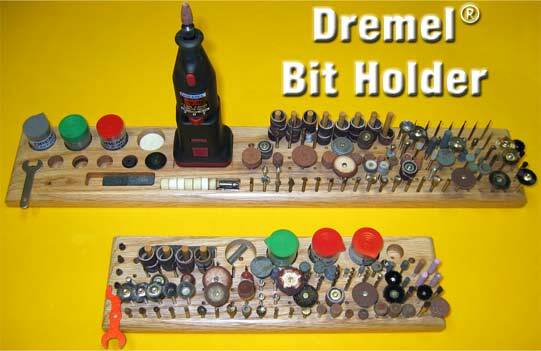 I intended to make such a Dremel bit display board before I headed off to medical school, but I never got around to it at that time or for several years thereafter. After recently breaking up with my loquacious girlfriend and suddenly having more free time, I decided to finally make this long-delayed project. I began by cutting oak boards to length, after which I used my router to round over three of the top edges on each board. The most difficult part was precisely spacing those myriad bit holder holes in straight rows spaced ½ inch apart. However, using my X-Y table, that task was fairly easy, although time consuming. I then used Forstner bits to drill flat-bottomed holes to store some of the other accessories, and added short vertical dowels glued in place to hold the sanding drums. I used my milling machine to make rectangular (OK, rounded rectangular) storage areas for small buffing wheels and honing stones. I glued a small magnet into each bit holder block to hold the collet wrench, spacing the magnet so its surface was flush with the block. On the large block, I added a similar magnet to hold the miniature circular saw blade, but I had that magnet project up somewhat from the surface of the block so removing the blade would be easy: just press down on one side, and it pops up for easy grasping. I finished the oak blocks using a new process I serendipitously discovered that makes oak (normally somewhat rough and grainy) as smooth as glass.